In Southwest Louisiana, nothing is as synonymous with "plate lunch" as BBQ. With a majority of plate lunch spots in town only offering their plates of burnt ends and traditional sides on Sundays, Bread & Circus Provisions on Bendel has raised the bar by offering their BBQ plate lunch 2 days earlier than most restaurants. Why put off until tomorrow what you can do today and why wait for BBQ on Sunday when you can have it on Friday! 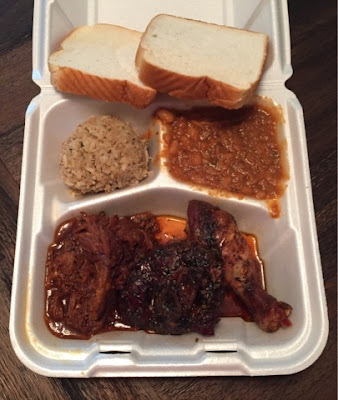 And unlike most BBQ plate lunches in the area, each Friday's plate comes with a selection of meats. One week it's Bread & Circus' homemade sausage and brisket with tasso. The next may be chicken, pork steak and stout pulled pork. Either way, you'll find your plate packed with Circus BBQ beans + dirty rice & Evangeline Maid white bread. The down home flavors are best complimented with Bread & Circus' Friday "2-for-1" beer special. Grab a friend, a few drinks and start the weekend early.